A Master sculptor and carver, Mamoudou Condé has had a lifelong interest in the arts. Born in Siguiri, Guinea, his love of the arts was sparked at a very young age, after taking part in “La Nuit de L'école Guinéenne”, a country wide cultural event organized by President Ahmed Sékou Touré. As he became aware of the work of his relative, Keita Fodeba, founder of the world renowned dance company Les Ballets Africains, Condé understood that his future would revolve around the arts; visual, musical, dance and drama. He traveled to Ivory Coast and studied sculpture with the renowned Sidime family, and furthered his studies in drama in Rome, Italy, where he supported himself as a carver. Condé traveled to the United States in the mid-1980’s to work as a Master sculptor. Still drawn to the traditional musical arts of his country, Mamoudou Condé created World Music Productions in 1994. The organization preserves, spreads, and promotes African culture using arts as a communicative vehicle: through technology, live performances, films, the Internet, radio and television, the traditional and contemporary heritage of African history, dance and music is shared with the entire planet. In 1998, Condé received the endorsement of Bailo Tellivel Diallo, National Director of Culture, to become the Managing Director and Producer of the country’s National dance and music ensembles Les Percussions De Guinée, Les Ballets Africains and Ballet National Djoliba. That same year, Mamoudou Condé broke a taboo and made history when he created NIMBAYA! (Formerly known as Amazones Women Master Drummers), the first women percussion group in Africa to perform on traditional instruments, historically reserved to male players only. World Music Productions has toured Les Ballets Africains, Les Percussions de Guinée, Le Ballet National Djoliba, Legends of West Africa and NIMBAYA! (Formerly known as Amazones Women Master Drummers), as well as several solo artists to Europe, Australia, Asia, North America, Africa and the Caribbean. In addition to performances in major theaters and festivals, Mamoudou Condé has worked with tens of thousands of children in schools accross the United States and abroad, sharing with them the beauty of Africa’s rich cultural heritage. Condé’s dedication to the preservation of the musical traditions of Africa has earned him respect worldwide. Notably, in 2003, the City of San Francisco honored Mr. Condé, and in 2004 he received the International Cultural Treasury Award from the City of Los Angeles. - February 25, 2003, as a symbol of respect, Mamoudou Conde opened the Board of Supervisor’s meeting for the City of San Francisco as Honorary Chair. - February 28, 2003, Certificate of Recognition from California Senator John L. Burton. 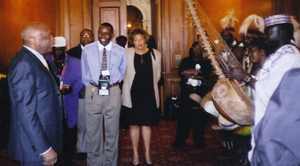 - January 16, 2004, International Cultural Treasury Award for Les Ballets Africains by Mayor James K. Hahn of the City of Los Angeles, State of California. - In January 2004, Mamoudou Conde was invited by the Mayor James K. Hahn of the City of Los Angeles, along with Ray Charles and Arthur Mitchell, as guests for the kick-off LA 2004 Celebration. - February 12, 2004, Certificate of Appreciation for Les Ballets Africains by Bernard C. Parks, City Council Member 8th District from the City of Los Angeles. - In March 2004, Conde appeared on PBS’ Arts Express with les Ballets Africains in Burlington, VT.
- March of 2004, Certificate of Honor from the City of Detroit.